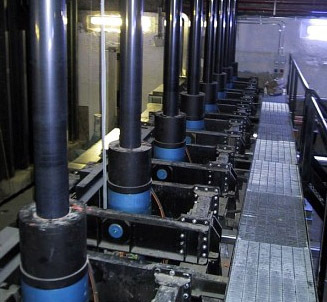 Safety Locks Protect Against Power Loss | Advanced Machine & Engineering Co.
Stepless holding of stage lifts at Italian opera house made possible with SITEMA safety locks on cylinders. Ratchless holding of the stage-position in case of a failure of the hydraulic system. As with all theater performances, the illusion of a reality on an opera stage must be preserved seamlessly and without visual distraction. Safety for the performers, of course, is never an illusion and one opera house in Genoa, Italy has taken positive steps to insure that reality. The stage lifts here are all equipped with safety locks to prevent movement in the event of a catastrophic power loss. Motion of these stage lifts, each capable of bearing loads to 100,000 lbs., is maintained by powerful hydraulic cylinders that are equipped with SITEMA safety locks Type KRG to maintain lift position. In normal power-on conditions, pressure on the locks annular piston ensures free movement of the cylinder rod by holding the clamping sleeve released against the force of an integral Belleville spring assembly. The essential function of the SITEMA safety lock in a power loss consists of a conical clamping sleeve, movable within the conical housing. In a released position, that is, upon loss of power to the cylinder, the annular piston keeps the clamping sleeve pushed against the Belleville springs. The spring washers press the clamping sleeve into the taper of the housing, whereby an initial frictional force is created between the rod and the clamping sleeve. When load is applied, the force increases in a self-intensifying manner, so the higher the load, the stronger the clamping. In normal applications, SITEMA safety locks function best for loads from 2 kN to 500 kN (~220 lbs. to 110,000 lbs.). When the load is acting on the rod, as shown in the force-path diagram, the movement of the rod is very slight. Even in the largest sizes, the movement does not exceed 2mm (~0.079) when the permissible load M is applied. Against forces in the load direction, the normal operating principle is most easily understood this way: the higher the force, the stronger the grip. When power is restored, the upward movement of the rod releases the clamping and a proximity sensor/switch then detects this condition and again permits unimpeded downward motion. Hydraulic oil (HLP) in accordance with DIN 51524-2 is used as the pressure medium for these safety locks. In detailing this application, Carsten Rother, sales director for SITEMA in Germany, comments, "This application and every application involving the protection of people must be given the greatest attention by our engineers. We realize the important role we played in this situation, where we worked closely with the lift manufacturer to supply the proper, safe solution. Smooth, unimpeded operation is critical in stage lift design, so it was important our products involved no interruption to the movement, that is until they are needed." SITEMA in Karlsruhe, Germany is the manufacturer of these devices, which are sold and serviced in North America by Advanced Machine & Engineering, part of the Goellner Inc. family, which has represented SITEMA since 1992. According to the manufacturer, SITEMA is the only company in the world specializing in the development and production of clamping units and linear brakes acting on round rods. The deliberate focus on development of these safety products has allowed SITEMA to become a recognized international provider, with a wide range of products that offer an optimal solution for many applications. 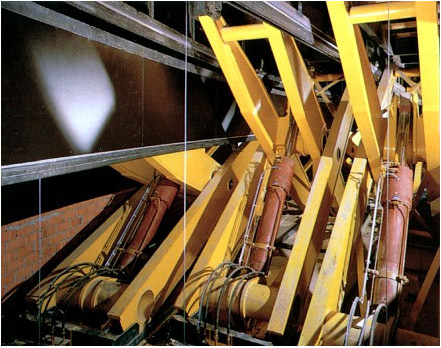 SITEMA safety locks are also suitable for suspension cylinders on overhead cranes, various materials handling/lifting equipment, machine tool components and positioning tables on all types of machinery. Other personnel protection applications include ski lifts, elevators and amusement park rides.